Liverpool supporters were caught up in trouble ahead of the Champions League final in Kiev after being apparently attacked in a restaurant. Ukrainian police announced two foreigners had been injured "in a fight" at the city centre establishment, and that two arrests had been made. Reports said the incident occurred at the Rooster Grill. The Mirror published a video of violent scenes, with police attending. According to reports, a group of around 20 masked thugs attacked the Reds supporters who were forced to shield themselves using tables and chairs. A statement from Ukraine's National Police said: "In the course of the conflict, two foreigners suffered injuries." It said officers from the Holosiivskyi police department were sent to the scene, close to the Olympic Stadium which will stage Saturday's match against Real Madrid, and that the victims of the attack and the alleged perpetrators refused to give statements. Merseyside Police said they were aware of the incident and have officers in Kiev. A further statement from Ukrainian police said the incident was being treated as "group hooliganism". It said the fight occurred at around 11pm local time on Thursday. The local police said their law enforcers were "looking for other participants in the fight to give their actions a legal assessment". 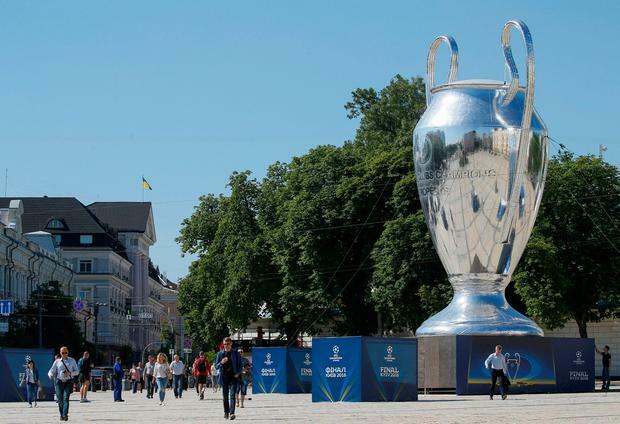 Separately, police said Thursday's Women's Champions League final between Lyon and Wolfsburg at the Valeriy Lobanovskyi Stadium in Kiev had passed off without any trouble.